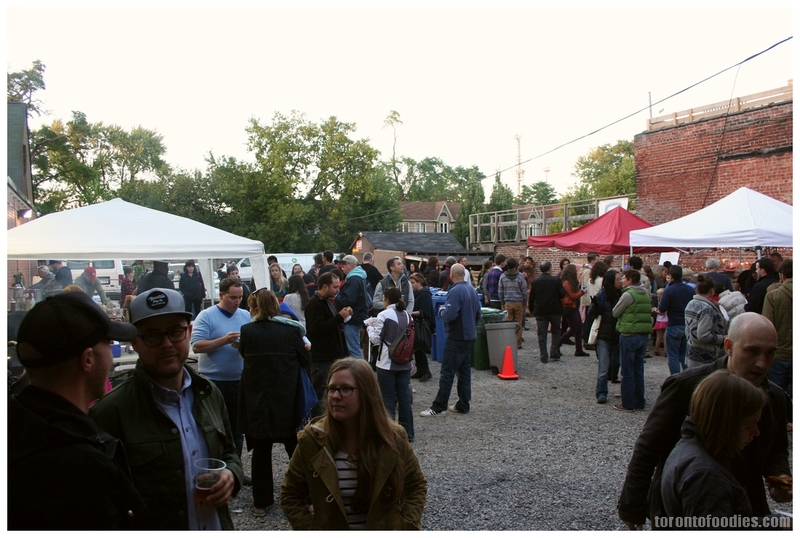 Saturday, September 14th marked the Inaugural Junction Night Market. 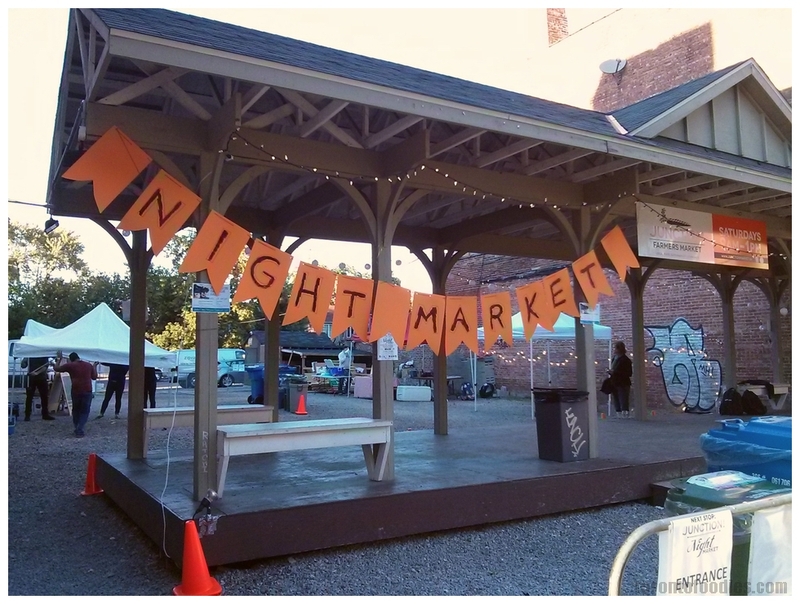 The event was organized by the Junction Market (who also run the Saturday morning Farmer’s Market), with proceeds from the Night Market going towards hunger programs in the community: the Junction Farmers Market Food Voucher Program & The Stop Community Food Centre. This was my first time visiting the Junction Train Platform, where the Farmer’s Market and Junction Movie Nights also takes place. 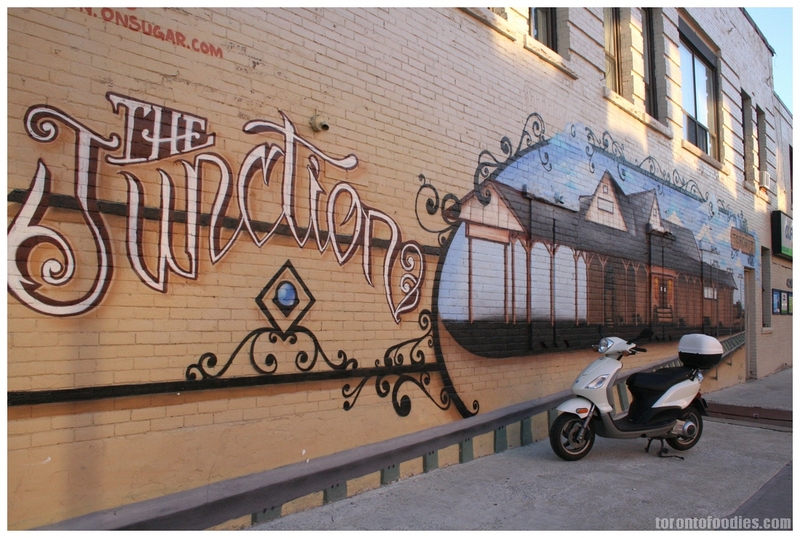 It’s situated on an empty lot between two buildings, a block west of Keele St. I managed to explore the area a bit, finding a few enticing brewery-bars and coffee shops. Event kicked off at 7pm, and was scheduled for 7pm-11pm, but the unexpectedly fabulous turnout cut the event short, with most vendors selling out by 9:00pm. Right at 7pm, the line to purchase food tickets and drink tickets ($5 each) was already about 10-person deep. The event was free to attend, so I was able to stroll in and take a peek at the food and drink offerings before buying the food/drink tickets. It was also a good opportunity to check out what other people were ordering/eating. 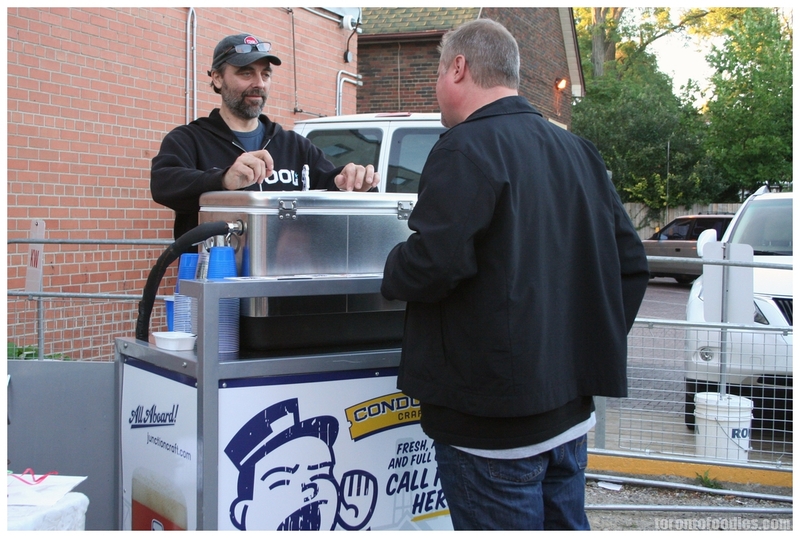 one of the few vendors not offering ham-related options. I’ve not yet been to their restaurant, but have certainly heard good things. They were featuring Trout Ceviche w/ Pickled Watermelon at the market, which would probably have been the next food item I would have tried at the market. 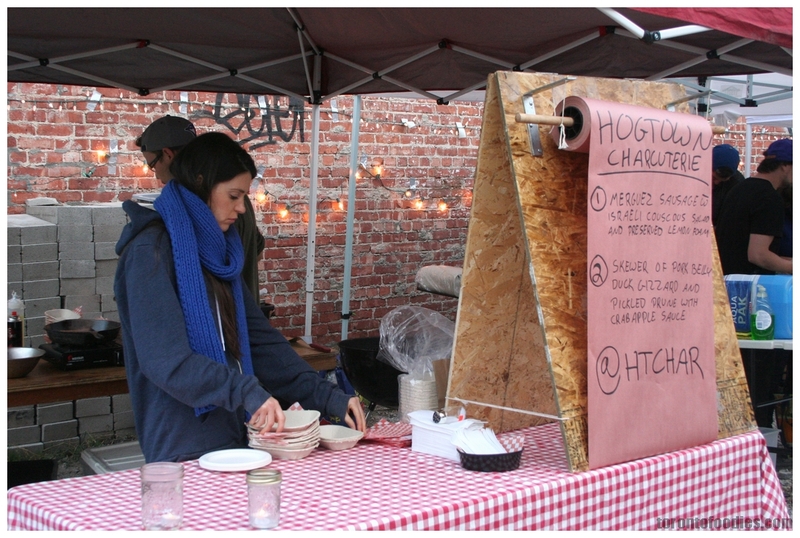 Hogtown Charcuterie [ @htchar ], originally from Kensington Market, are looking for a new home but are regularly at the Junction Farmers Market. 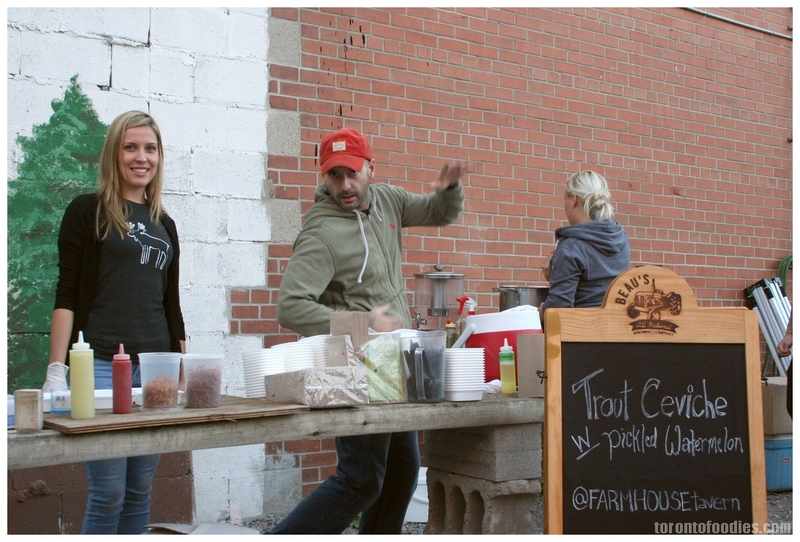 Their Merguez Sausage w/ Couscous drew a lot of attention from patrons walking around. While I saw several people walk around with the hefty sausage on their plates, I also saw plenty of fresh sizzling skewers thrown onto the grill. Alehouse in conjunction with The Hole In The Wall, both area brewery-pubs. I am unable to resist grapefruit, and loved the ale’s aromatic citrus with a light bitterness, and a good amount of fruitiness on the palate. I think they were sold out pretty early into the evening. Junction Craft Brewing [ website / @JUNCTION_CRAFT ] featured their “The Conductor” ale, and I think they also had another beer or two available. They had to pull two additional casks during the evening, and still completely sold out by 9pm. Also present was The Beet Organic Café , whose heirloom tomato bruschetta with sheep ricotta and warm honey were quite popular that day. 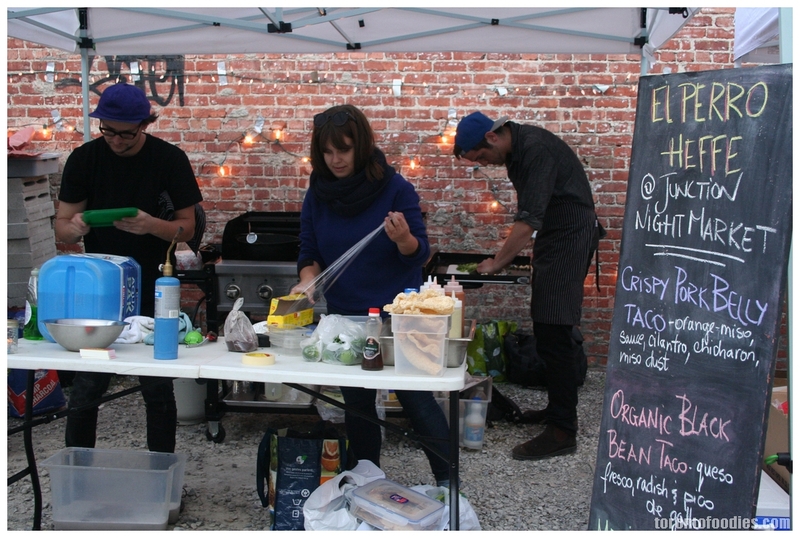 They exemplified local sourcing, making their evening’s food offerings from ingredients picked up at the morning’s Farmers Market. Delight Chocolates set up their stall a bit later into the evening, offering a spicy hot chocolate, great for keep warm while the mercury dropped at night. 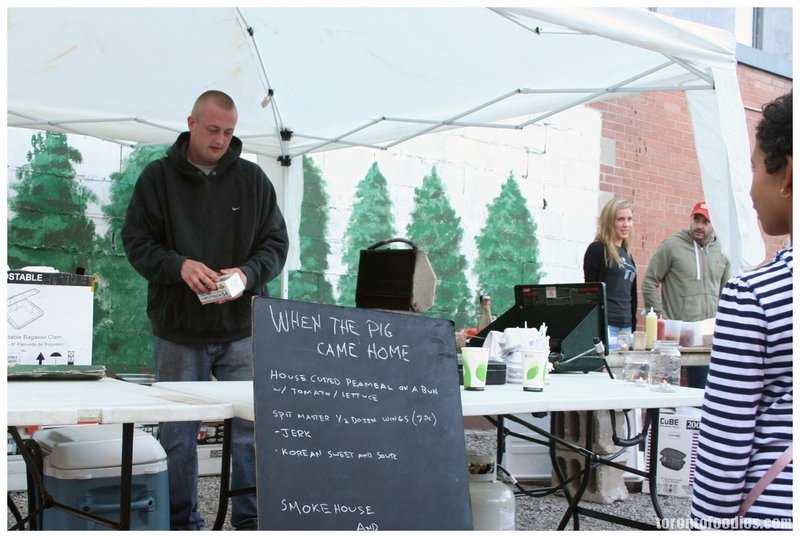 When The Pig Came Home Smokehouse & Larder probably had the third longest lines of the night, with peameal sandwiches and wings being surefire sellers. I heard several folks in line saying that the wings were great. 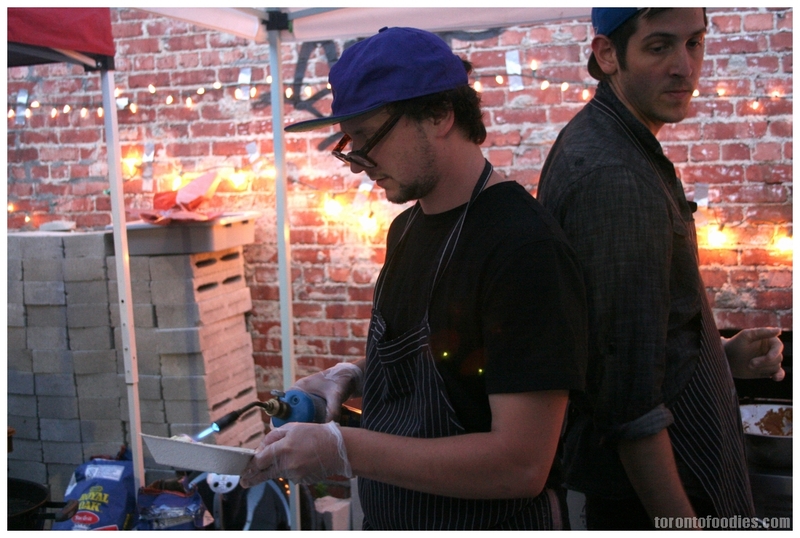 Cut The Cheese’s line [ website / @CuttheCheeseTO / @ChefGavinGusche ] was the longest of the night. I was in line from 7:45pm to 8:45pm, with around 30-40 people ahead of me. I initially ignored this stall, but once I saw diners walk around with these absolutely stacked sandwiches, I was sold. It was clear that they weren’t skimping on ingredients, and a look through their twitter highlights just how much passion and effort went into each single component. 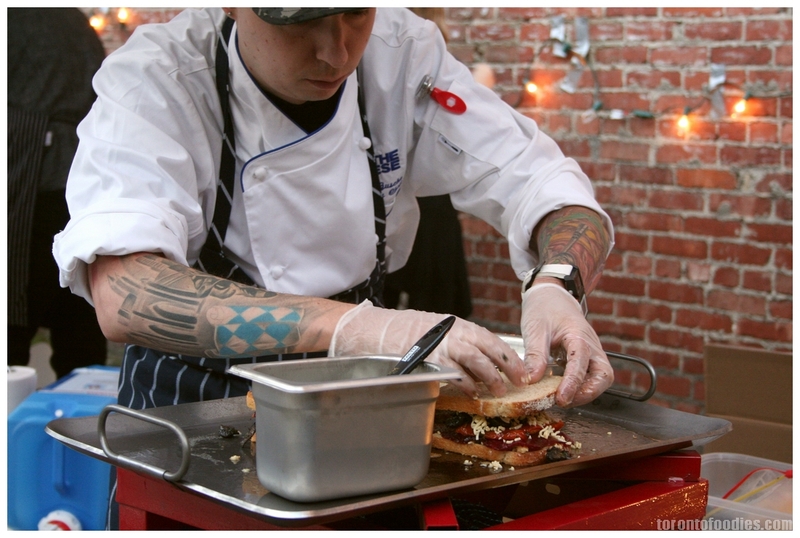 They managed to serve 100 Grilled Cheeses in under 100 minutes — that’s pretty spectacular. That’s using a griddle big enough for only 3 sandwiches at a time! 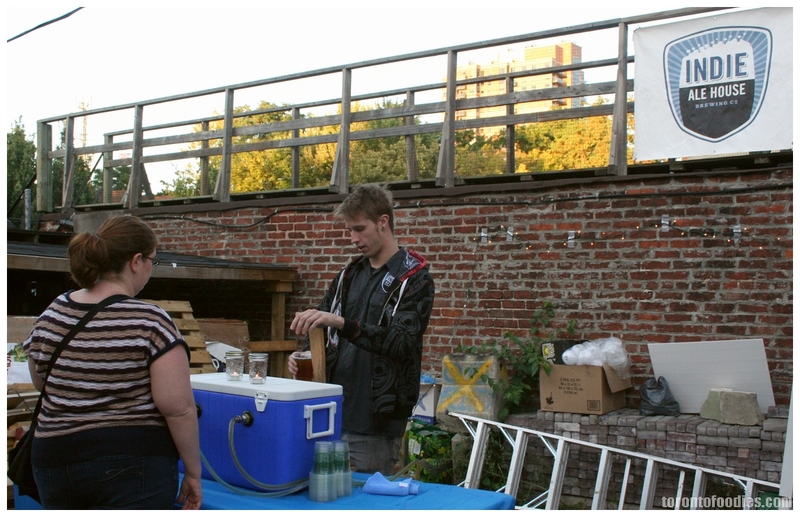 After running out of the grilled beets at 9pm, they continued to sell beet-less sandwiches for the rest of the evening. 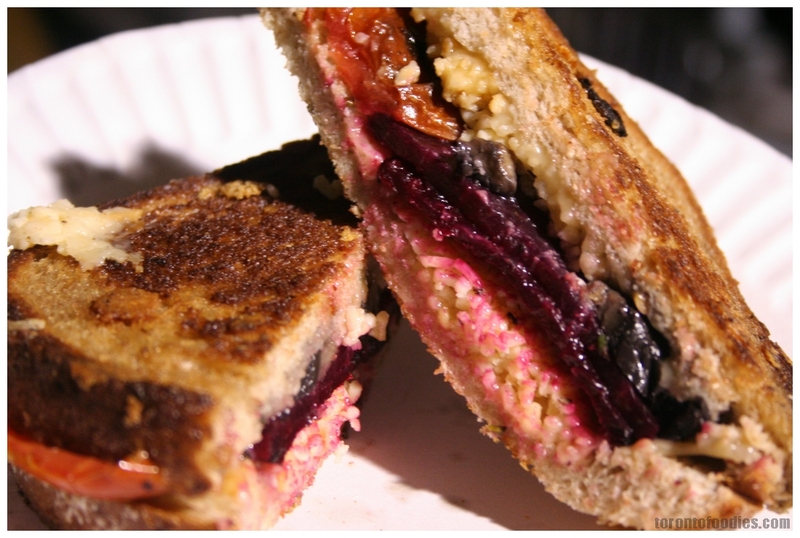 Grilled cheese sandwich, filled with: Grilled Beets, Oven-Dried Tomatoes, Smoked Gouda, and Portobello mushrooms. Each component played their part in the sandwich – mild sweetness from the beets, mildly tart tomatoes, meat mushrooms, and deliciously smokey gouda. The bread was also buttery and crunchy on the outside, as some of the excess cheese from the grill managed to stick on. The gouda needed a bit more time to melt, but the flavours were great. I still had the lingering smokiness in my mouth almost an hour later! 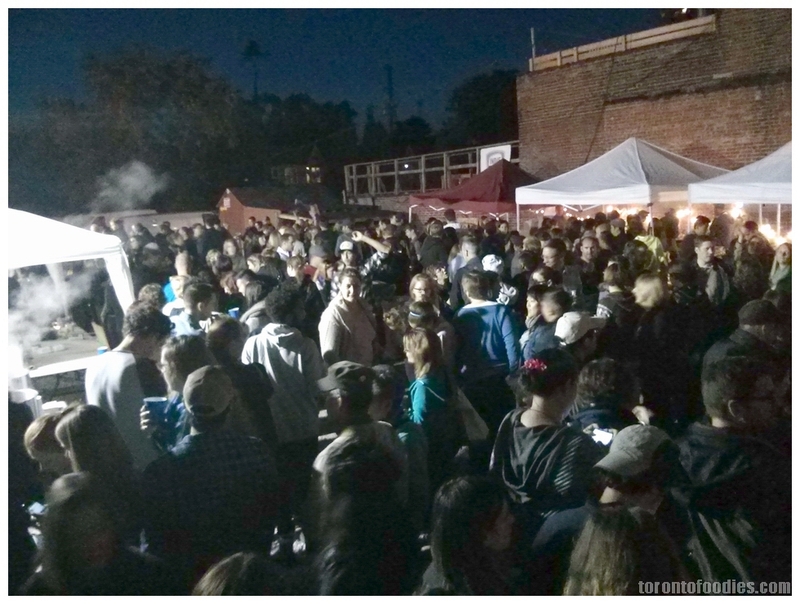 El Perro Heffe [ facebook / @ElPerroHeffe ] were completely sold out of everything by 8:30pm, drawing the second-longest line-ups of the eveving with their taco selection and s’mores. Dave of El Perro Heffe blowtorching the avocado marshmallows for their mexican s’mores — sweet corn crackers, avocado marshmallows, and chili-lime dark chocolates! 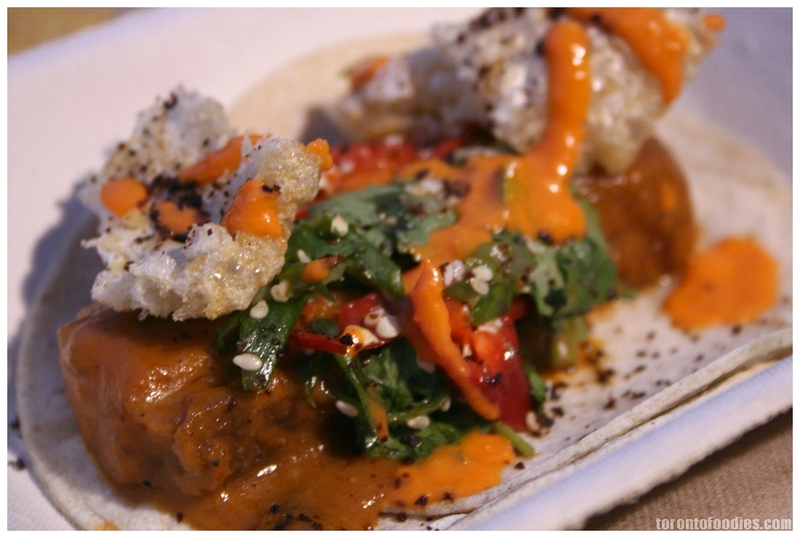 Crispy Pork belly taco in orange-miso sauce — the pork belly was fantastically tender, though the orange-miso sauce was a bit confusing – neither component was distinct, but as a whole worked well to provide both acidity, savouriness, and moisture for balance. The Thai bird chilis and cilantro really made the dish sing, brightening up an otherwise heavy meaty dish. 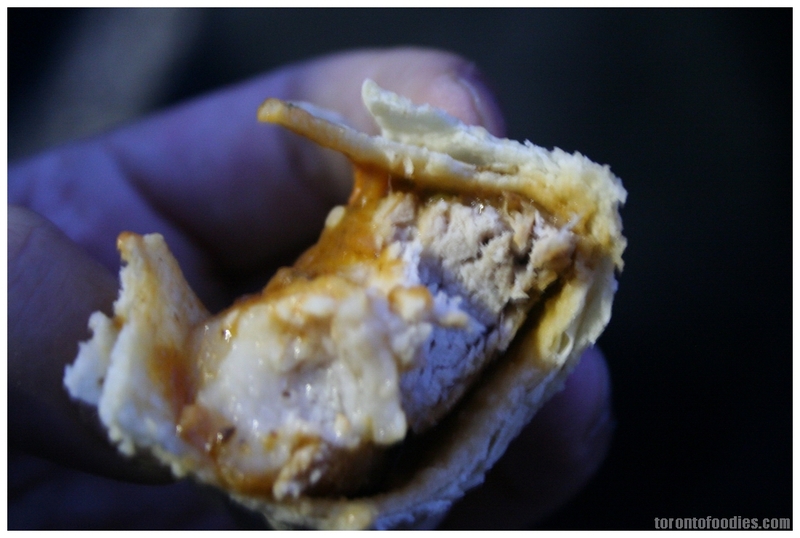 The Chicaron wasn’t as crunchy as I had hoped, sadly. 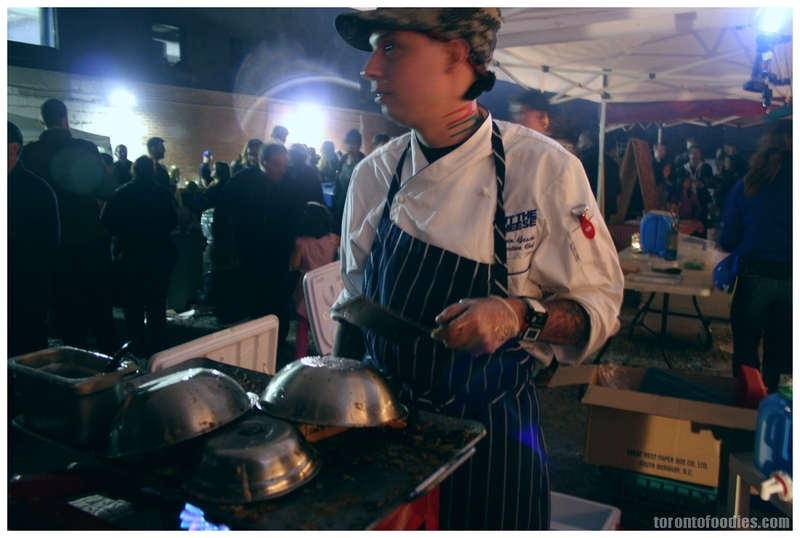 I spoke to Dave afterwards — the hefty chunk of pork belly was impeccably tender due to 36 hours of brining, followed by hours of braising, then deep fried on location just before serving. He lamented not being able to get the bellies fried crispier, would would have been fantastic. Despite that, this was my clear favourite item of the night. This was the scene of the line-ups by 8:30PM. I hear that the event organizers were expecting maybe 400-500 people that night — far more than that showed up. While I heard a lot of complaints about the line-ups, I think the vendors were pretty damn efficient. The put things in perspective, Cut The Cheese and El Perro Heffe, the two longest lineups, managed to serve 100 portions in 90 minutes. 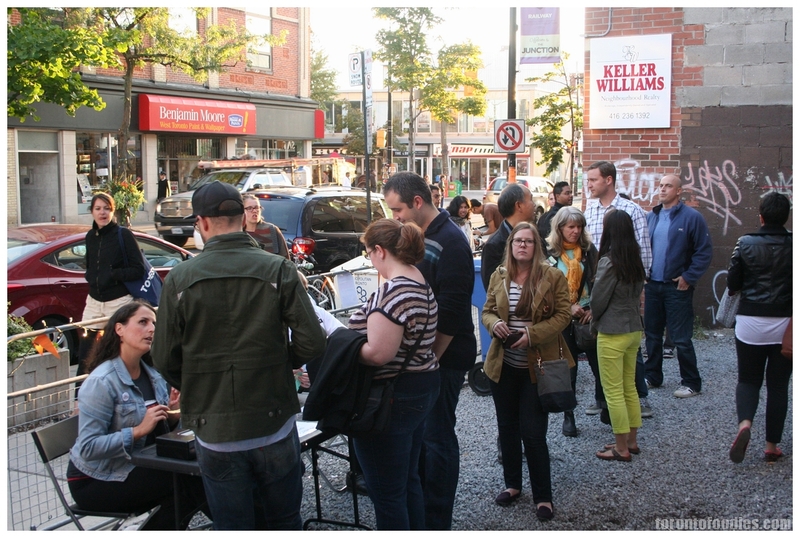 I’m hoping the Junction Market can make this into a more frequent event, maybe monthly or bi-weekly in the summer. There’s definitely demand to support the event, especially at a very reasonable $5 price point.